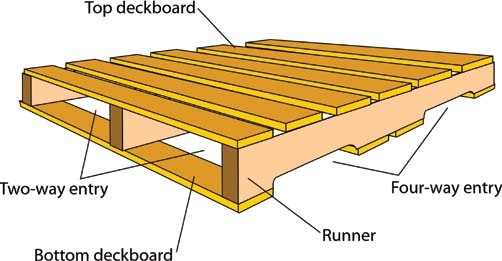 A pallet is a flat transport structure that supports goods in a stable fashion while being lifted by a forklift. Goods are placed on it and they are secured with strapping, stretch wrap or shrink wrap for shipping. Two-way pallets: Pallets with forklift openings on only two ends. Also referred to as “unnotched” pallets. Partial four-way entry pallets: Pallets with standard forklift openings on two ends and smaller side openings on the remaining ends. Four-way entry pallets: Pallets with forklift openings on all sides for full accessibility. At DRT International we take pride in ensuring that your goods are packed safely.